We are manufacturers & exporters of high-qualityCervical Lumbar Traction Equipment from India. manufacturing &Offering you a complete choice of products which include cervical & lumbar traction equipment lcs 133dx, cervical & lumbar traction equipment, cervical & lumbar traction equipment lcs 132 and traction table. 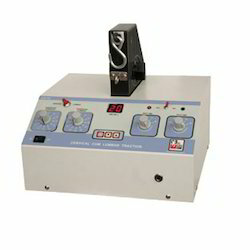 For the treatment of Lumbar, Cervical and upper Dorsal Region.